In recent years, we have witnessed the trend of remote working. Fortunately, working from different locations has become easier thanks to great technology. 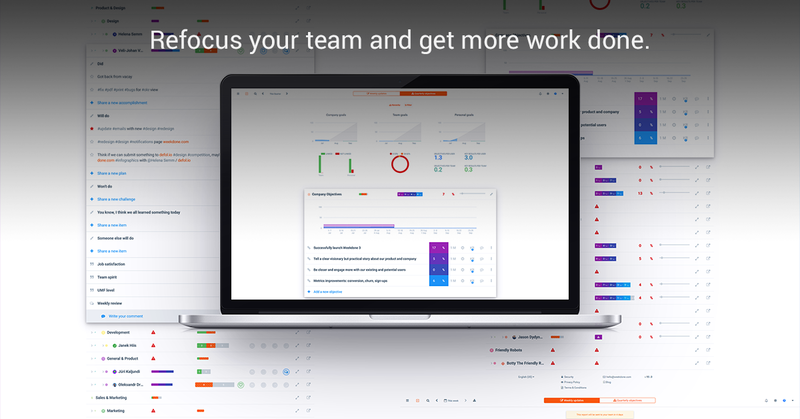 More and more distributed teams sign up with Weekdone to get a better picture of their teams' achievements and plans. In addition to status reports, there are other must-have tools for remote teams we recommend. As our Weekdone team works from three different locations, we are well aware of the joys and pains of being a member in a distributed team. You need to get the collaboration process going like a well oiled machine and make sure the team meetings are productive. The last thing we want is wasting time mindlessly on unproductive team meetings. That's also why we've launched a free team meetings toolbox. It's a collection of tools that we use ourselves and encourage every team leader to try out. Whether you need help before, during or after the meeting. Whether it's with the preparations process or the tracking the time, the tools will take some weight off your shoulders. In the U.S. office workers spend an average of 4 hours per week in meetings. They feel more than half of that time is wasted. Therefore, employees in the U.S. waste average 2.5 hours a week that costs businesses 37 billion dollars a year. In the UK workers waste 2 hours and 39 minutes in meetings every week, and it's costing businesses an estimated 26 billion pounds a year. In Australia it is estimated that the employees waste around 2,6 hours a week to unproductive meetings, resulting in a 20 billion dollar loss. <a href="https://blog.weekdone.com/meetings-around-the-globe/"><img src="https://blog.weekdone.com/wp-content/uploads/2014/08/infographic-map-meetings-time-2.png" alt="Here's How Meetings are Held Around the Globe [map]" style="border:0;width:100%;max-width:800px" /></a><br>Infographic created by folks at Weekdone, the <a href="https://weekdone.com/">better team management tools company</a>. How are meetings held in different corners of the world? – In America meetings are increasingly virtual, aggressive, taking a 'confrontational' approach and often include formal presentations by participants. Americans like to follow the agenda and demand punctuality. Although meetings are often an open debate of an issue, the outcome must be a decision. – In Japan, meetings are about relationship building and information exchange. Agendas are rather important, which why the meetings are well-structured. Although punctuality is important, finishing time can vary. It's quite common to schedule another meeting as a result. – In UK, meetings are very frequent and viewed as open debate of an issue. They are inconclusive with relatively little preparation done beforehand. Agendas are followed loosely, which makes the meeting tone rather informal and emotional. Although punctuality is important, meetings often last for hours. One meetings often ends with scheduling of another. – In Russia, meetings are formal, serious and structural, often just for the purpose of information dissemination. Punctuality isn't their number one priority, which makes the meetings run long. Agendas aren't followed that intensely and there is a good chance the meeting will not result in a decision. – In Australia, meetings are punctual, starting with few minutes of small talk. Although the agendas are followed rather loosely, they don't like to spend a lot of time on meetings, since they are often viewed as an open debate of an issue. If a decision is not reached, new meetings must be scheduled. – In Mexico, meetings start late and run over the allotted time. Punctuality is not considered a virtue. Meetings are emotional and often informal with less emphasis on the agenda. Free flow of ideas and information is encouraged, which makes the meeting lengthy. – In such a diverse country like South-Africa, it's rather difficult to point out common factors. If there is anything we can conclude, its that the meetings are very diverse but demand a prior research, a lot of patience and time. Whether your remote team has to consider two or even more cultures, there is a way to make team meetings more productive. 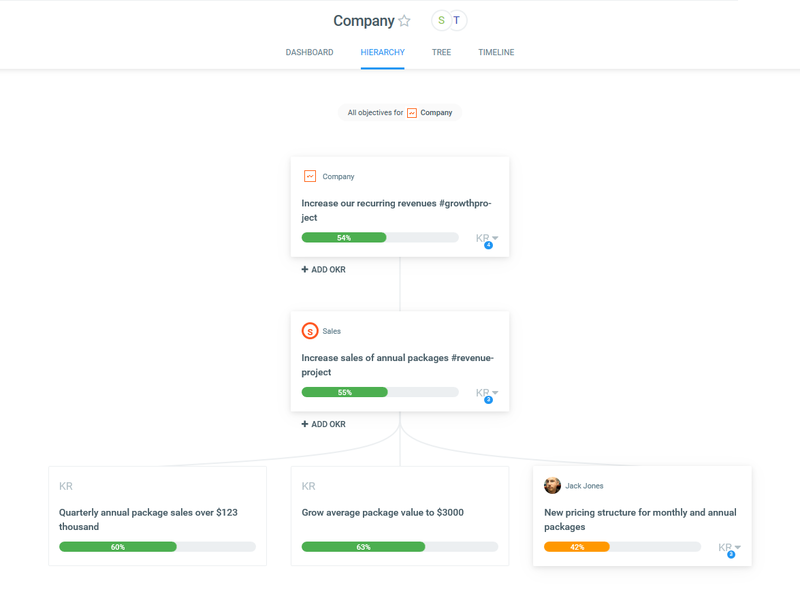 We have also shared our tricks how status reports can save team meetings. In addition, we would recommend you to try out our weekly reports that provide structure and agenda to everyday discussions. How do you conduct meetings with your remote team? Remember to follow us on Twitter, Google+ and Facebook for all about status report, weekly reporting, meetings and more!